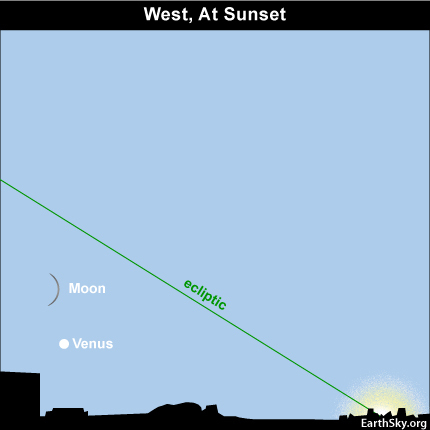 Tonight presents the final pairing of the moon and the planet Venus in the evening sky until the autumn of 2011. 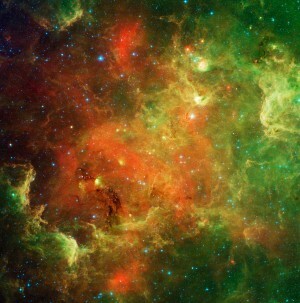 Or, if you live in the southern hemisphere, it is the last evening pairing until the spring of 2011. Unfortunately, for much of the northern hemisphere, a “perfect” storm of events makes the sighting of the waxing crescent moon and dazzling Venus difficult – if not downright impossible – to observe. Bright star in east on October 2010 evenings? It’s the planet Jupiter. Our sky chart shows the moon and Venus at sunset for mid-northern latitudes. Notice that the ecliptic – the center stripe on highway of the moon and planets – hits the horizon at a shallow angle. That places the moon and Venus to the side of the setting sun. That is why these two worlds follow the sun below the horizon quite soon after sunset. However, that’s not all. The moon and Venus lie south of the ecliptic, and that causes the moon and Venus to set all that much sooner after the sun. Talk about a double whammy! At latitudes close to 40 degrees north – like Boulder, Colorado – Venus sets about one-half hour after the sun and the moon sets about one hour after that. You will need a level horizon, clear sky and binoculars to see these two worlds in the glow of twilight. As for the southern hemisphere, the moon and Venus could not be much better positioned for viewing. The ecliptic hits their horizon almost perpendicularly at sunset. In the southern half of the globe, the moon and Venus stand over the setting sun, so the moon and Venus stay out until well after dark!